Look around. The world is a dark place. People are wandering, roaming the world, searching for meaning. They are trying out this philosophy, that religion. People are groping. Where are the answers? Where is the light? 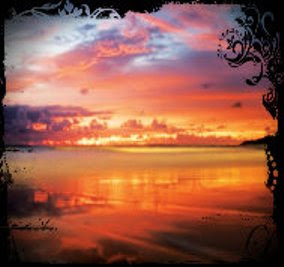 Light was created on the first day, and the Torah says, "It was good." It is a woman's mitzvah to light the Shabbat candles. It is a woman's privilege to bring "good" into the world through light. How can those two little flickering candles on my table, light up the big, dark world? The Shabbat candles usher in the holy day of Shabbat. Thus those little candle lights direct us to a much greater light, the light of Shabbat. The light at the end of the tunnel is bright -- it breaks the darkness. Shabbat also breaks the darkness. It is not just a day when we stop working. 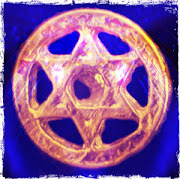 Shabbat is the Day of the Candles, the Day of Light, the day when we clearly see our purpose in this world. Shabbat is the day on which we see we have a soul. The soul itself is called a candle -- the candle of God. It is the light of the world. It infuses spirituality into the body and into all materialism. Without this spirituality, the world would be in a state of darkness. It is the soul that connects human beings to God. Similarly, Shabbat is the soul of the week. Without Shabbat, the world is a body without a soul. When women light candles, we welcome that extra light into the world. Do you know that Shabbat also gives us an extra soul? During the rest of the week, one soul is powerful enough to receive the available holiness. But we need two souls to handle all the extra holiness that enters the world on Shabbat. It is all too easy to ignore the extra soul and the extra spirituality that is available every Shabbat, and to spend the day just eating and sleeping. We need to ask ourselves, Is this the most efficient use of an extra soul? I once heard it said that it's much easier to overcome internal conflicts on Shabbat than all week, because during the week the odds are one against one -- one body versus one soul. But on Shabbat, it is two against one -- two souls versus one body. On Shabbat we have a real chance to be more in control. Candles are lit at romantic dinners, aren't they? What makes a dimly lit room romantic? Its the candles -- they draw people together on a soul level. It goes beyond eating a meal together -- that's mundane, that's physical. Rather, its about two humans connecting on a deep, spiritual level. That's exciting. That's romantic! The candles do it. We women are the ones who ignite this romance with God. This is what Shabbat candle lighting is all about. So let's give our mitzvah some thought and put it into its proper spiritual dimension. Do you feel the light on Shabbat? Do you feel your soul light up? Our tradition gives us guidelines to experience the spiritual dimension of candle lighting. Buy beautiful candlesticks; make sure they and the tray they rest on are polished to emphasize the importance of this mitzvah. Lighting with olive oil is highly regarded because of the intense light it produces. Be dressed in beautiful clothes at candle lighting time and, of course, be on time (18 minutes before sunset on Friday afternoon). Prepare, think, and be focused on this great experience. Our tradition also tells us something remarkable. 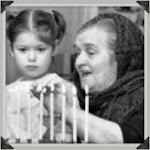 To help her children fulfill their potential, a woman should feel tremendous happiness when lighting her Shabbat candles. What won't parents do to have good children? They pay high tuition for the best schools; give them extracurricular activities, hobbies, and vacations to stimulate their minds and strengthen their bodies; feed them good, healthy meals; and buy them fine clothes. 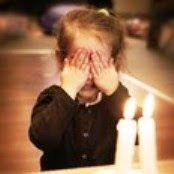 Yet Jewish sources tell us that one of the most important things we can do for our children is to be careful and happy when lighting Shabbat candles. This is our investment for meriting good, wise, and spiritually fulfilled Jewish children. 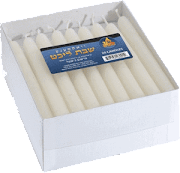 Shabbat candles also create peace in the home. How? People enjoy the Shabbat food more with the added light. And there is something deeper. Candles connect people on a spiritual level. Souls don't fight. Bodies fight. Candlelight evokes a soul connection between people, which creates real peace in the home. Shabbat reminds us that there was a creation and a Creator. Just as Shabbat comes after six days of work, our ultimate connection to God comes in the World to Come -- after years and years of work! This is clarity. This brings sanity. Human beings ask, What are we living for? The light of Shabbat answers, For an eternity of light, warmth, and closeness to our loving God. Shabbat is the goal of the week, not merely a rest stop to prepare for the coming week. In truth, we work all week long for this day of pleasure. There is even a tradition to count the days in anticipation of Shabbat. "We're getting there... We're almost there... We're here!" It's like a bride counting the days to her wedding -- not because the wedding will mark the end of her preparations, but because it is the goal. Shabbat is our goal, our destination. On Shabbat, all difficulties of the previous week change into a new reality. On Shabbat, all pain changes into beautiful, new challenges. 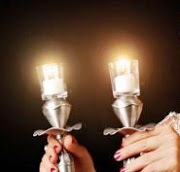 May we light the candles joyfully, carefully, and happily until the world is lit completely with the lights of Shabbat. Of all the Jewish holidays and festivals, Sabbath is the only one mentioned in the Ten Commandments. 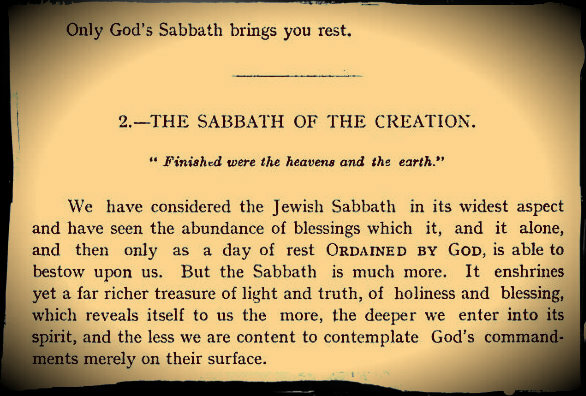 Set apart by God as a day of calm retreat and reflection, the Sabbath is considered the most important of all holy days by Jews. It is customary to light two candles for the two important Biblical references: "Remember the Sabbath" (Exodus 20:8) and "Observe the Sabbath" (Deuteronomy 5:12). 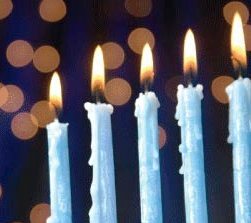 However, many families light an additional candle for each child and some people light seven candles for the seven-branched menorah. 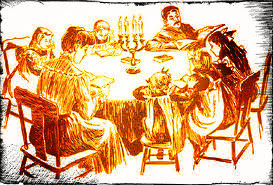 Click photo to read about Shabbat tables. The genius of Shabbat is that it restores a sense of values and priorities. It "forces" Jews to leave their computers and offices, thus reuniting them with friends and family members who more urgently need their attention, their company, and their devotion. Click to read and listen to traditional Shabbat blessings for Friday night and Saturday morning. I think the most delicious Shabbat chicken I ever ate on a Friday night was in Furnace Creek, Death Valley, in September 1973, where I went camping with my roommate... I took a Cornish hen, cut up a raw onion and a raw tomato into a few wedges, and put them in the cavity of the hen, then wrapped the whole thing in aluminum foil, and stuck it into the coals of the fire. Corn on the cob and baked potatoes are also delicious when cooked this way. Click if you're just curious about Shabbat. Be it ever so humble, there's no Shabbat like home. Click for Shabbat videos from around the world. What's So Great About Being Jewish? The 7-branch Menorah symbolizes the 7 days of Creation, and the center light represents Shabbat, the centerpiece of our week. 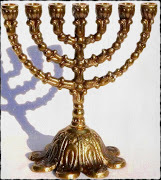 Click photo for menorah history on Wikipedia. Click photo for knitting instructions. Click photo to buy Jewish books. 2011 - 2016 MiaSherwoodLandau. Picture Window theme. Theme images by mammuth. Powered by Blogger.